Photo from the coal ash spill on the Dan River in 2014. Credit: Waterkeeper Alliance. Shared under a Creative Commons license. 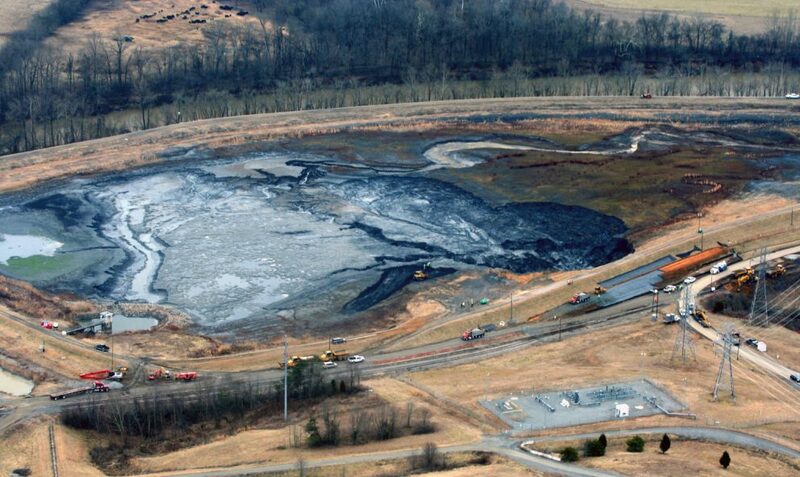 Coal ash is produced by coal-fired power plants and is often stored in ponds. If the walls of these ponds fail, they can spill coal ash into nearby surface waters – as happened in the wake of Hurricane Florence in 2018, in Virginia’s Dan River in 2014, and in Tennessee in 2008. These spills can have significant consequences, because coal ash contains contaminants such as mercury and arsenic. “Our goal with this work was to see whether we could use bacteria to create a biocement matrix in coal ash ponds, making the coal ash stiffer and easier to contain,” says Brina Montoya, an assistant professor of civil, construction and environmental engineering at NC State and co-author of two papers on the work. Specifically, the researchers wanted to make use of bacterial species that feed on urea and, in the presence of calcium, produce a stiff substance that binds to surrounding solids. The resulting byproduct is called biocement. In laboratory experiments, the researchers found that the process works with coal ash – the bacteria create biocement using coal ash, and the coal ash slurry becomes stiffer. In other words, the coal ash mixture is much less runny. “This will certainly make it easier to contain, and less likely to contribute to pond failures that discharge coal ash into surface waters,” Montoya says. But the researchers are hoping that the bacterial biocement will also have a second benefit. Because most coal ash ponds are simply unlined holes in the ground, contaminants in the coal ash can leach into groundwater, raising environmental and public-health concerns. The researchers are hoping that the biocement can also trap potentially toxic metals in the coal ash – though that work is ongoing. “We still have a lot to do before this technique could be implemented on a large scale, but we would welcome any industry partners who are interested in helping us fine-tune the process for use in addressing the challenges surrounding coal ash storage,” Montoya says. The most recent paper on the work, “Enhancement of Coal Ash Compressibility Parameters using Microbial Induced Carbonate Precipitation,” is published in the Journal of Geotechnical and Geoenvironmental Engineering. The earlier paper on the work, “Microbial Induced Calcium Carbonate Precipitation in Coal Ash,” is published open access in the journal Géotechnique. Both papers were co-authored by Shahin Safavizadeh, a former Ph.D. student at NC State; and Mohammed A. Gabr, Distinguished Professor of Civil Engineering and Construction in NC State’s Department of Civil, Construction and Environmental Engineering. The work was done with funding from the Electric Power Research Institute and the National Science Foundation, under grant number 1554056. Abstract: Microbial induced calcium carbonate precipitation (MICP) was experimentally implemented on two coal ash materials (i.e., CA1 and CA3) to investigate the efficacy of the treatment on the hydraulic and compressibility properties of the material. Oedometers used in testing were modified to enable the injection of treatment solutions and to provide the ability to monitor shear wave velocity. The coal ash specimens were treated to reach different levels of shear wave velocity, which corresponded to varying amounts of CaCO3 content. The hydraulic conductivity and shear wave velocity values were assessed throughout the loading process. Results indicate that the MICP treatment decreased the compressibility (compression index decreased by a factor as high as 2), and the hydraulic conductivity (decreased by a factor as much as 0.05). The slope of log(σ′V)-VS relationship (β’) decreased from 0.31 for the untreated material to 0.01 with treatment. In parallel, the increase in the shear wave velocity after treatment increased the intercept of the relationship between log(σ′V)-VS (i.e., α’) from 38 m/s to 383 m/s. The correlation between small-strain and large-strain parameters are explored and discussed. Abstract: The long-term storage of coal ash in impoundments can lead to concerns of structural stability as well as trace element migration to local surface water and groundwater sources. Microbial induced calcium carbonate precipitation (MICP) offers a potential approach for minimising leachability of heavy metal trace elements from coal ash by calcium carbonate cementation. In this study, a protocol for MICP treatment of coal ash has been experimentally developed. The MICP treatment is applied to three coal ashes from different power plants, and their response to the developed treatment protocol is assessed. Possible factors affecting the MICP treatment of coal ash are discussed in terms of efficacy and inhibition of the stabilisation process. For this purpose, several approaches such as shear wave velocity, electrical conductivity, pH measurement, acid washing, scanning electron microscopy, energy dispersive X-ray spectroscopy and X-ray photoelectron spectroscopy were implemented. The results indicated that carbon/carbide content of the fly ash material has an important role in the efficacey of the MICP treatment process. The most likely explanation is carbon/carbide aids in the nucleation of calcium carbonate precipitation.